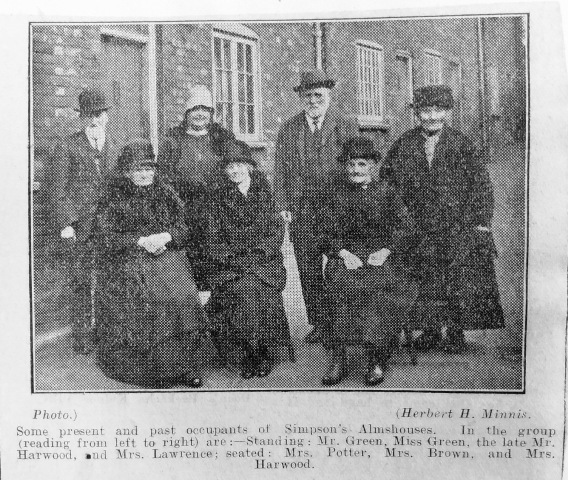 Some of the residents prior to 1931. 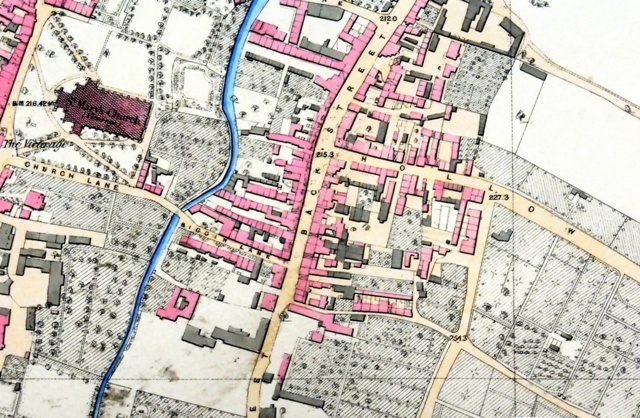 Detail from the OS map 1851, 2ft:1 mile. Biggin Lane (in centre of image) later followed the course of the river southwards. The later almshouse is situated just below the W of Hollow Lane. Note that on this map the Warner and Biggin almshouses are not named. 1773. 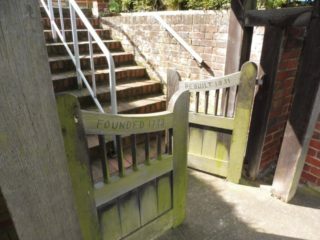 The year of the famous Boston Tea Party was also the year in which Elizabeth Simpson founded some almshouses in Hitchin. They were unusual in that they were founded for the benefit of dissenters – those who shared basic religious beliefs with the Church of England but disagreed about some matters. In particular their basis was the Bible as the sole authority for faith and practice. Many of the other foundations of the time were for the benefit of those with links to the Church of England. Elizabeth gave 3 properties in Biggin Lane which were converted into 5 cottages, for 2 married couples and 3 single people. By her will of 1788 (proved 1795) she further endowed the almshouses with £333 6s 8d, the interest being used to provide for the residents. Further endowments were by Nathaniel Field in 1815 (£300 4% Bank Annuities, the interest to be divided among the poor inhabitants, after payment for repairs of the houses), Elizabeth Harley in 1864 (£400 17s. 6d. India 3% stock) and Mary Carter in 1876 (£450 stock of the Hitchin and District Gas Company). The trustees also held a sum of £79 9s. 4d. in Bombay, Baroda and Central India Railway stock, producing in aggregate about £55 a year in about 1900. The beneficiaries were to be Protestant dissenters who attended the Meeting House for Divine Protestant Dissenters in Back Lane (now Queen Street). From time to time applications from persons of other persuasions were received but turned down because of the original requirements. This was upheld in 1963. While it was unusual for such restrictions to still be in force, it was felt there could be issues about changing the foundation requirements. As churches closed and merged, beneficiaries were firstly poor people belonging to Christchurch Methodist/URC church in Hitchin, secondly, those worshipping in other protestant churches within and around Hitchin, and thirdly, any poor resident of Hitchin. Various residents are mentioned in the minutes books. Many lived to a good age. The 1932 minutes book has a note in the front about ages and time of residence. The average length of residence was 6 years. Many residents lived into their 80s; the oldest recorded lived to 97. The frontispiece to NR8/11/4 includes a formal photograph of the residents. 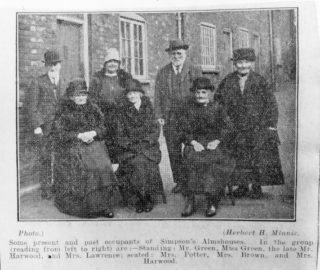 There is also an affectionate article about some of the residents in Herts Express Feb 1931, with the cutting included in the minutes book. 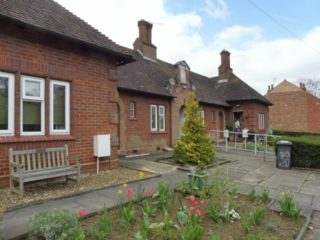 When a resident became unwell or infirm it looks as if they could not stay in the almshouses alone. In some cases they went to live with family or friends. In other cases relatives were allowed to move in with them, but stipulations were made that they would have no tenancy rights and would have to vacate the property should the resident die or move elsewhere. Payments were made to residents under the terms of the endowments. In 1908 each of the five inmates received £8 10s. and 1 ton of coal. Payments ceased for new residents in Dec 1963 and for existing residents in May 1966. Minutes books for these almshouses are stored at HALS, and show some interesting developments in the issues the trustees had to consider. Earlier minutes suggest meetings were infrequent, sometimes well over a year apart, and the main subjects for discussion were the appointment of new residents. As time progressed meetings became more frequent. In Feb 1922 the plan was to hold meetings once a year and much of the discussion turned towards the maintenance and upgrading of the properties. In April 1948 it was suggested that a rota be drawn up so that trustees would visit the almspeople on regular basis. The original buildings were in Biggin Lane. The exact site is unclear but the photograph taken by Minnis shows buildings each side of the narrow lane. This suggests the site was at the north end, judging by the buildings shown on the OS map. Note that the extent of Biggin Lane has changed following the town centre redevelopment including following the line of the river southwards. 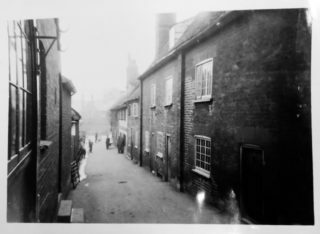 In the late 1920s the Town Council decided to develop the town centre so needed the almshouse site. The compensation was used to pay most of the costs for new dwellings in Hollow Lane, which were eventually 4 residences. One nice touch was to incorporate a beam from the old building into the new. 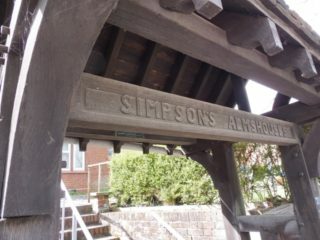 The new almshouses were officially opened in 1931 and named Simpson’s Cottages. As time passed improvements were required, which caused some issues for the trustees. By 1957 the matter of bathrooms was raised, but it would be costly even if there was space and there was the possibility that the almshouses would be condemned if facilities were not provided. It was about 10 years till they were installed, half the cost being supported by local Council grants. Other repair costs would amount to about £7000. To put this into context, that was almost the cost of a 1900s small terraced house in Edmonton, North London. There are a few references in the minutes to repairs needed. Interestingly they were sometimes carried out at the residents’ expense. The almshouses are still active, under the auspices of Christchurch Methodist Church. Income is about £11000 a year, which covers the costs with little to spare. NR8/11/3 and NR8/11/4 are the minutes of the Charity. This page was added on 14/04/2019.